Been doing some work around google health and yesterday I searched for ‘tonsillitis’ and got the image on the left, this didn’t work in Canada! 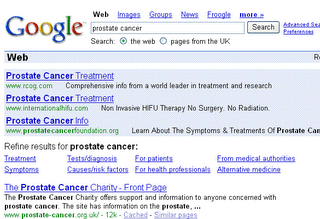 Just did a search for ‘prostate cancer’ and got the second image – note the refine function. Interestingly, or perhaps disappointingly, it didn’t give the same results with ‘prostatic carcinoma’ – perhaps synonyms will be plugged later. Although is this google health? Wouldn’t that be stand alone like google finance – something like http://health.google.com? One of the refine functions is ‘For health-professionals’ which when clicked gives the following search syntax ‘more:for_health_professionals’. 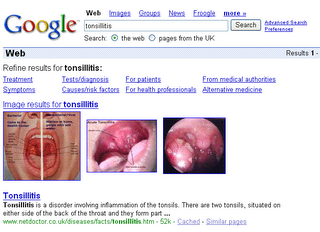 Alas, for tonsillitis the first page of results are for patient information sites! For prostate cancer it did slightly better – but not hugely!